The rain is coming down in sheets as NOAA scientist Josh Chamberlin eases the outboard through a narrow channel on the Snohomish River. We’re headed to a small island just southeast of Marysville, but for all practical purposes this is a trip straight into Puget Sound’s past. As we drift through, we look up at 200-year-old Sitka spruce trees. Tall reeds and grasses that hang over the slow-moving water give the place the feel of a southern swamp. “A little heart of darkness,” jokes Chamberlin as he draws the boat to the shore. I am here with Chamberlin and his colleague NOAA researcher Anna Kagley, and we are all staring at a mysterious, almost ghostly forest that rises up from the edge of the water. The island is only accessible by boat, and the pelting winter rain all but assures that we won’t have much company today. Hidden among the trees, the place feels as remote as a wilderness, but occasionally, in a corner of the horizon you can see the smudge of headlights as cars make their way down Interstate 5 through the mist. "[Tidal forests] were part of the mosaic of habitats that once made Puget Sound so productive for salmon that the region’s iconic southern resident orcas evolved to eat Chinook almost exclusively." The interstate aside, much of the region once looked like this. Hundreds of years ago, old-growth cedar and spruce loomed over estuaries and bottom lands throughout Puget Sound, creating what are known as tidal forests. 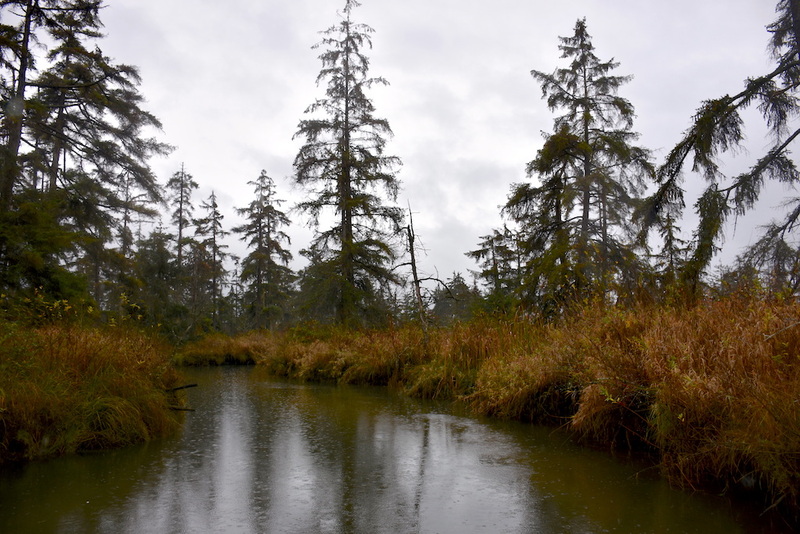 These forests were the Pacific Northwest’s answer to the Everglades — giant spongy swamps with a touch of saltwater that covered about 20 square miles in the Snohomish delta alone. Now most of what remains is limited to this island, some of the finest salmon habitat in all of Puget Sound. In the spring, the slow, blind channels around Otter Island will be jumping with juvenile coho and Chinook. At various points, almost every type of salmon in the region will be found here, from coho and Chinook to chum and pink and sockeye. They will come here to rest and fatten up. Then, after as much as a year, they’ll move on to the open water and eventually the ocean. Here, the freshwater of the Snohomish River mixes with water from the incoming tides of Puget Sound. The saltwater is almost undetectable, but it is enough to classify this as an estuary and, by any measure, a fish factory. This tidal mixing is critical to the young salmon as they begin their transition from freshwater to marine environments. Estuaries, where freshwater mixes with saltwater are a signature feature of Puget Sound. In fact, Puget Sound is itself a vast estuary — the second largest by area in the U.S. behind Chesapeake Bay — fed by more than a thousand streams and rivers like this one. This tidal mixing by itself is not unusual, but there are a few things that set this place apart. We bump against the bank and jump out onto one of the few patches of flat, (mostly) solid ground. Otter Island is built like a pick-up sticks-style logjam bound together by centuries of sediment and peat moss. Trees grow on top of other trees (“nurse logs”) and assorted vegetation is tangled everywhere, making any sort of clear pathway out of the question. To complicate things, the ground is riddled with deep, hidden pools that seep up from the river. While the conditions may be less than ideal for a hike, they are perfect for rearing salmon. Coho and Chinook in particular are drawn to Otter Island because of its complexity — the island’s “weird geometry” as one botanist described it. “You see all the vegetation hanging over?” asks Chamberlin. The forest’s three-dimensional structure provides shade and protection from predators. It also means food. Overhanging branches drip bugs and other nutrients onto the water below, and the tidal sediments that gather around the island are a buffet of amphipods and crustaceans. 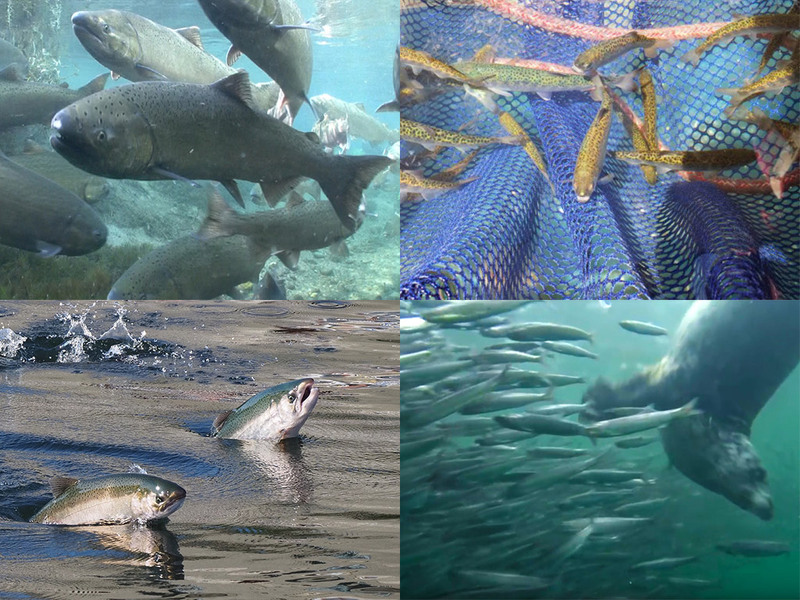 All these conditions add up to bigger, stronger salmon that are more likely to survive when they swim out to Puget Sound. In that sense, Otter Island and other estuaries like it are at the center of the high-profile race to save Puget Sound’s threatened salmon. Before their decline, tidal forests were part of the mosaic of habitats that produced so many salmon that the region’s iconic southern resident orcas evolved to eat one species — Chinook — almost exclusively. That began to change more than a hundred years ago as much of the land was diked for farming and other development. The story is familiar: As the habitat declined, so did the fish. Chinook are now listed as threatened and the southern residents are critically endangered and facing extinction. Last year, Governor Inslee's Southern Resident Orca Task Force identified restoration of estuarine habitat as one of the priorities for boosting salmon numbers to feed hungry orcas. It’s not just tidal forests that have disappeared. Tidal wetlands of all types have declined by an area of about 116 square miles — roughly 3.4 times the size of Lake Washington. That includes habitat such as tidal mud flats, scrub shrub wetlands and emergent marshes, each with their own special characteristics. Tidal forests are some of the hardest hit of these, having decreased by more than 90 percent. Significantly more exist on Washington’s outer coast and the Columbia basin, but most of what remains in this region can be found here on the Snohomish delta. View of waterway and Sitka spruce trees at Heron Point. Photo: WA Department of Ecology. In essence, that means 150-acre Otter Island and a smaller 20-acre plot at nearby Heron Point. Otter Island is owned and managed as conservation land by Snohomish County. Heron Point just to the north was recently purchased by the Tulalip Tribe which intends to protect the habitat forever. Tidal wetlands in the estuaries of Puget Sound have diminished by 116 square miles since the mid-to late-1800s. They can be categorized into four main types: Tidal forests — or tidal freshwater swamps — dominated by Sitka spruce; scrub shrub wetlands dominated by shrubs and small trees; emergent marshes dominated by perennial plants that grow in water; and mudflats. For more information on the current state of estuarine ecosystems see article: "The mosaic of deltas and other estuarine ecosystems in Puget Sound" in the Encyclopedia of Puget Sound. Protecting what remains is now paramount for biologists. So far, holding the line is working. Otter Island and Heron Point remain — almost miraculously — much as they have been for centuries. The next step may be more difficult. What can be done to bring back the lost 90%? “It’s a long game,” Chamberlin says. Tidal forests were built layer upon layer, tree upon tree over centuries. “We can’t just come in and suddenly make this type of habitat,” he says. It’s going to take some time. Maybe lifetimes and generations. What scientists can do is make an approximation. Recently, the state breached several dikes in this area, opening up miles of new salmon habitat along the Snohomish. During our float over here we see what’s possible. The area known as the Smith Island restoration is now flooded along with the nearby Qwuloolt estuary. Both areas are parts of an EPA-funded plan to preserve estuaries throughout Puget Sound. The goal is to restore about 7,380 acres of estuarine habitat in Puget Sound by 2020. [See: “Saving the last estuaries” in the Encyclopedia of Puget Sound]. The newly formed estuaries may not match the full richness of Otter Island, but scientists are optimistic. Playing the long game could also include planting trees as has been done on the Nisqually delta, a place seen by many as the crown jewel of estuary restoration in Puget Sound. There, ecologists have started to approximate tidal forests along the sloughs that might one day provide shade and sustenance to salmon. Scientists now argue that it’s not enough just to identify and restore old habitat. They need to manage future habitat. The need to look to the future is only increasing. That's where tidal forests face some of their greatest challenges and opportunities. Factors like climate change and sea level rise in particular have forced scientists to take a broader view of habitat restoration. Rising tides from the earth’s melting ice caps could impact places like Otter Island and potentially most other restoration projects in the area. More saltwater incursion could upset the delicate balance of life here. Redirecting rising salinity away from Otter Island could be one step, but scientists also wonder if they can somehow make lemonade out of lemons. Could they identify other forests higher in the watershed that might one day be in the path of rising tides? In some cases, that might bypass the need to plant more trees. It's a long shot, they say, but a potential strategy under consideration. Otter Island may be a link to the past, but in that sense, it is also a possible look at the future. Whether tidal forests will one day make a return to Puget Sound remains an open question, but for now, Otter Island continues to remind us of what we once had and what we still stand to lose.